To celebrate Bike Week LA, May 16-20, The Source will be offering a glimpse into the world of those who get around by bicycle. On a typical day, Maddie Brozen rides recreationally as well as to commute and run errands. She will be riding during Bike Week LA from May 16-20. Will you? Maddie Brozen has found Los Angeles to be a great place to get around by bike, flouting the city’s car-oriented image. 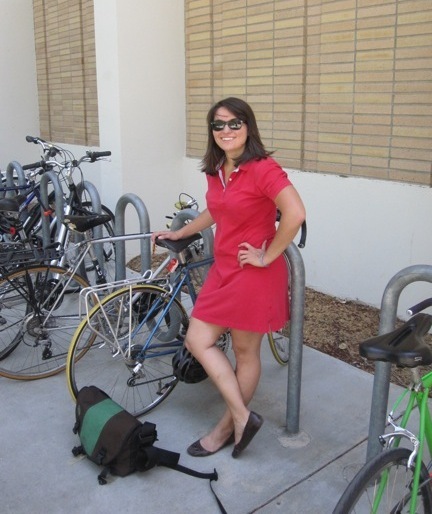 Not only does the graduate student studying transportation planning at UCLA commute by bike to school and work, she is a frequent participant in L.A.’s Critical Mass group ride. 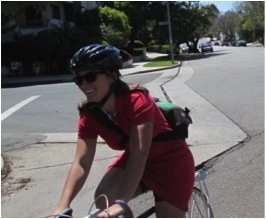 On her way to class, Maddie takes residential side-streets to campus, taking about 10 minutes to ride the 1.5-mile distance between her Westwood apartment and classes. Riding is faster than walking or taking the bus and it’s cheaper than parking on or near campus. Heading home, the flexibility of biking makes it is easy for Maddie to stop by the store to grab a few things for dinner and run errands. And it’s easier for her to find a spot to park her bike; an increasing number of destinations around Westwood have installed bike racks. When Maddie travels to downtown Los Angeles, she finds that riding her bike to the Wilshire and Western Purple Line Station and then jumping on the subway is the most inexpensive way to get there — and can also be the quickest depending on how bad traffic is. (Here’s a cross-town route that Maddie uses). Join Maddie and thousands of others riding during Bike Week L.A. Pledge to ride and you can win some great prizes, including a bike as part of a commuter cycling package from REI and gift cards from other sponsors.